The May Communion Meeting for 2019 will be the third weekend in May 2019 (May 17-19). Services will be on Friday night, May 17 beginning at 7:00 p.m. Services Saturday night, May 18, at 6:30 p.m. preceded by supper at 5:00 p.m. Sunday service 30 minutes early starting at 10:00 a.m. as we will observe communion that morning to be followed by lunch in the Fellowship Hall. 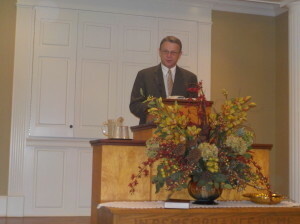 Elder Rickey Harcrow from Fort Payne, AL will be with us, Lord willing, for our 100 year anniversary meeting. Brother Rickey is Pastor of Elgin Crossroads Primitive Baptist Church in Florence, AL. and President of the Dekalb County Commissioners. Services Friday night, Sept. 6 at 7:00 p.m. Saturday morning, Sept. 7, at 10:00 a.m.. Starting service early to read a biographical history of Bethany since its inception followed by fish fry lunch. (No Saturday night service this year) Meeting concludes Sunday, Sept. 8, at 10:30 a.m. followed by lunch. Pray the Lord’s blessing on the meeting. Elder James Hall will be the guest minister on the 5th Sunday in March, 2019 (March 31) this year. 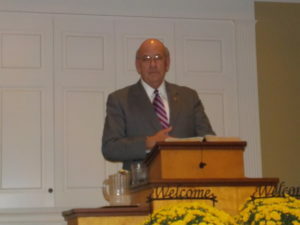 Brother Larry and Brother James are swapping pulpits that Sunday. He is pastor of Yalobusha Primitive Baptist Church. Elder Jonathan Wise, New Albany, MS will be the guest minister the 5th Sunday in June, 2019 (June 30) this year. Brother Jonathan and Brother Larry are exchanging pulpits that Sunday. Brother Jonathan is Pastor of Little Flock in Burnsville, MS.
A Primitive Baptist Minister’s prayer meeting is currently being held at Bethany each month on the 2nd Sunday night beginning at 6:00 p.m. The prayers are mainly directed for the Lord to bless our little churches with an increase numerically and spiritually and to send more labourers (ministers) into the Lord’s harvest. Although the ministers will do the praying, everybody is invited and welcome to attend who are interested in the prosperity of the kingdom of God.